KONIGSSEE, Ger.—Elisabeth Vathje slid to sixth place for the second-straight year at the skeleton World Championships on Saturday in Konigssee, Germany. The two-time gold medallist on the World Cup this year slid to a three-run time of 2:36.84 over the last two days for her best career result on the challenging 16-corner track in Konigssee. The second heat on Friday was cancelled due to heavy snow, making it a three-run World Championship race. “I don’t think I have ever finished better than 14th in Konigssee so to be in sixth here at World’s is pretty nice,” said Vathje. The 22-year-old Calgarian put down the third fastest run in the opening heat at 52.27, but wasn’t able to hold on to her podium position on the final day. Vathje was in good company at the premier skeleton race on the international calendar this year. Three of the women in the top-six call Konigssee their home track, and one is the Olympic Champion. Germany’ Jacqueline Loelling was crowned the queen of skeleton for 2017 after winning with a time of 2:35.35. Tina Hermann, also of Germany, was second at 2:35.60. Lizzy Yarnold, of Great Britain, fought back into podium position with two solid runs on Saturday, finishing third with a time of 2:36.08. Sitting fourth overall on the overall World Cup standings with one gold, one silver and two bronze medals, Canadian rookie Mirela Rahneva of Ottawa, struggled to find her top gear and slid to eighth place with a time of 2:37.12. North Vancouver’s Jane Channell was on the unlucky side of Friday’s snow race where she was stuck in 12th at 2:37.78. After her second run on Friday where she jumped into the top position, snow plummeted down on the Bavarian Alps. Race officials deemed the heat to be unfair and made the decision to go with a three-run race. “It’s really unfortunate because of the weather yesterday. Jane had an amazing run, and it’s too bad (the heat was cancelled) because this season she keeps getting really unlucky,” said Vathje. The World Championships wrap up on Sunday with the final two runs in the men’s skeleton race and the four-man bobsleigh event. Bobsleigh CANADA Skeleton is a non-profit organization and the national governing body for the sports of bobsleigh and skeleton in Canada. With the support of its valued corporate partners – Karbon, Driving Force and Conceptum Sport Logistics – along with the Government of Canada, Own the Podium and the Canadian Olympic Committee. 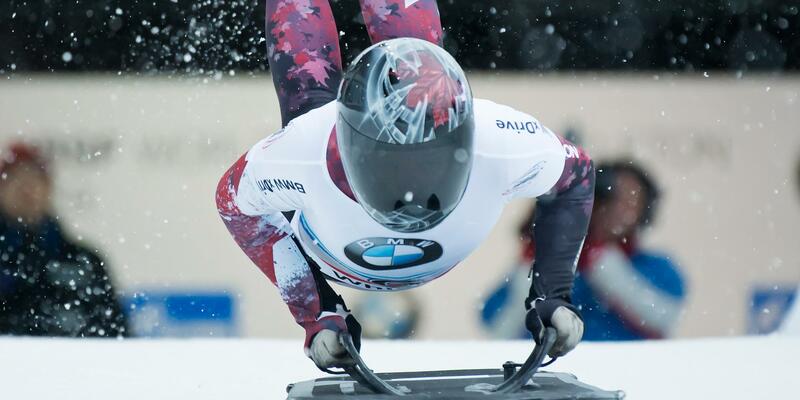 Bobsleigh CANADA Skeleton develops Olympic and world champions. Please visit us at www.bobsleighcanadaskeleton.ca.